Holography based on metasurfaces is a promising candidate for applications in optical displays/storage with enormous information bearing capacity alongside a large field of view compared to traditional methods. To practically realize metasurface holograms, holographic profiles should be encoded on ultrathin nanostructures that possess strong light-matter interactions (plasmonic interactions) in an ultrashort distance. Metasurfaces can control light and acoustic waves in a manner not seen in nature to provide a flexible and compact platform and realize a variety of vectorial holograms, with high dimensional information that surpasses the limits of liquid crystals or optical photoresists. Nevertheless, the full capacity of all polarization channels remains to be explored for improved information storage capacity within metasurface holograms and in holographic optical devices. In a recent study, Ruizhe Zhao and co-workers demonstrated a new method to realize multichannel vectorial holography for dynamic display and high-security applications. In the study, birefringent metasurfaces were explored to control polarization channels and process very different information through a rotation. The reconstructed vectorial images could be switched from one form to another with negligible cross-talk by selecting a combination of input/output polarization states. The results are now published in Light: Science & Applications. The scientists first derived a multiplexing algorithm to support the dynamic vectorial holographic display and encryption process. By using the correct polarization keys, the receiver could obtain the exact information delivered. By increasing the complexity of such images, even higher flexibility was obtained alongside a detailed analysis of the reconstructed vectorial image properties. Since the device containing metasurfaces is compact in size, in practice, it can be easily transported with encoded information. To pattern the design of interest, Zhao. engineered several dielectric silicon metasurfaces on top of a glass substrate using plasma etching, followed by electron beam lithography. The metasurfaces were composed of 1000 x 1000 nanofins, i.e. nanostructures with the ability to augment heat transfer via surface area enhancement and liquid-solid-interactions. The researchers studied two schemes of multiple polarization channels; with or without rotation using the birefringent dielectric metasurfaces to realize the holograms. 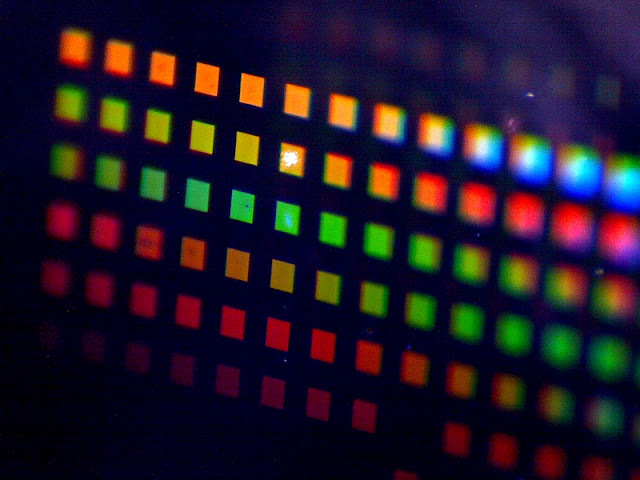 The birefringent dielectric metasurfaces were designed using silicon nanofins on top of a glass substrate. To achieve the desired phase shifts, 2-D parameter optimization was conducted using a rigorous coupled wave analysis (RCWA) method. The RCWA semi-analytical method is typically applied in computational electromagnetics to solve scattering from periodic dielectric structures. The length L and width W of the nanofin were in the range of 80 to 280 nm, height at 600 nm and period size P at 400 nm. The values were carefully selected to ensure the phase of the output light eliminated any undesired orders of diffraction. For the simulation, the nanofin was placed on a glass substrate and subjected to a fixed wavelength of incident light at 800 nm. Simulation results indicated the amplitude of transmission for most nanofins with diverse cross-sections were beyond 90% efficiency. The scientists determined orientation angles of the nanofins using equations derived in the study to experimentally demonstrate multichannel polarization multiplexing. For optical characterization of the metasurface holograms, Zhao. used an experimental setup. The magnifying ratio and numerical aperture of the objective lens were carefully chosen to collect all the diffraction light from the sample and reconstruct holographic images in the Fourier plane. The scientists used a second objective/lens to capture the Fourier plane on a CCD camera. They also separately observed two scanning electron microscopy images of the samples with or without rotation to characterize the engineered surface. As a proof-of-principle, using the metasurfaces, Zhao. constructed holographic images of a cartoon tiger and a snowman that appeared with high fidelity and high resolution when illuminated by x-polarized light. When the incident light was switched to y-polarization, the reconstructed images changed to a teapot and a teacup. In this experiment, only two polarization channels were available in the setup, with both pairs of the holographic images reconstructed and made to disappear simultaneously by rotating the polarizer behind the sample. The experimental results were in agreement with the simulation to confirm the study's fundamental design principle. The net diffraction efficiency of the hologram was defined as the ratio of the intensity of the single reconstructed image to the power of incident light. The scientists were able to design and construct more complex multiplexing functionalities with 12 channels using the same principles of design thereafter. The vectorial images were viewed as holographic reconstructions with the input/output polarization combinations developed as proposed. The technique could also be used to encrypt different images at the same spatial location. In encryption, such superposition can convey a different meaning on reconstruction. As an example, the scientists chose the image of a die with six representative surfaces, and by using different combinations of input/output polarization states, encoded up to six images for viewing. The multiplexing algorithm derived in the study aided the dynamic vectorial holographic display and the encryption of images encoded on birefringent dielectric metasurfaces. By using the correct polarization keys, a receiver could obtain the exact information delivered. Higher flexibility could be obtained by increasing the complexity of the image and changing the medium of encryption to titanium dioxide (TiO2) or silicon nitride (SiN). The correct polarization combination secured the information for enhanced complexity during decryption. The multichannel hologram maintained a relatively large working bandwidth since the reconstructed images could be observed away from the designed wavelength of 800 nm. The study established a design and engineering technique that combined birefringent properties of simple nanofins used as the building blocks, with extra-design freedom of rotation matrix and smart multiplexing algorithms. The results enabled high-dimensional multichannel polarization multiplexed holograms, with up to 12 polarization channels. In this way, efficient light-based encryption and integrated multichannel holographic display techniques can pave the way for advanced communication in high-security applications.